3 August 1914: Entered Army service as a War Volunteer in Infanterie-Regiment von der Goltz (7. Pommersches) Nr. 54. 10 September 1914: Joined Reserve Infantry Regiment 54 in the Field. 11 October 1914: Transferred to hospital after an accident. 21 November 1914: Transferred to Infanterie-Regiment Prinz Moritz von Anhalt-Dessau (5. Pommersches) Nr. 42. 8 February 1915-23 March 1915: Detached to the Officer Aspirant Course in Warthelagen. 26 May 1915: Joined Infantry Regiment 42 in the Field. 11 May 1916: Sick/in hospital. 21 December 1916: Joined Infantry Regiment 42 in the Field. 8 May 1918: Wounded/in hospital. 14 October 1918: Joined Infantry Regiment 42 in the Field. 29 October 1918: Wounded/in hospital. 16 December 1918: Returned to Infantry Regiment 42 as Court Officer. 20 January 1919: Transferred to a Border Defence Formation in the area of II Army Corps. 25 April 1919: Transferred to Reichswehr Infantry Regiment 3. 1 October 1920: Transferred to Infantry Regiment 5. 1 January 1922-31 March 1922: Detached as an instructor to Coast Defence Detachment I, Swinemünde. 1 April 1922-16 March 1923: Detached as an instructor to Coast Defence Detachment V, Pillau. 1 May 1924-15 August 1924: Detached to the Combat School Course at Troop Training Area Ohrdruf. 1 October 1924: Transferred to the 13th (Mortar) Company of Infantry Regiment 5. 27 May 1925-31 March 1926: Detached to the staff of I./Infantry Regiment 5. 18 October 1926-16 November 1926: Detached to the Combat School Course in Döberitz. 1 April 1928: Chief of the 13th (Mortar) Company of Infantry Regiment 5. 9 October 1928-1 November 1928: Detached to the Combat School Course in Döberitz. 1 October 1934: Company Chief in Infantry Regiment Stettin. 15 October 1934: Commander of I./Infantry Regiment 18. 6 October 1936: Commander of II./Infantry Regiment 80. 26 August 1939: Commander of Infantry Replacement Regiment 34. 1 April 1940: Commander of Infantry Regiment 478. 5 February 1941: Führer Reserve Army High Command. 2 March 1941-31 August 1941: In hospital. 1 September 1941: Deputy Commander of Division 172. 16 January 1942: Leader of the Reserve Officer Course in Wehrkreis [Military District] Command XII. 2 August 1944: Führer Reserve in Wehrkreis Command XII. 2 October 1944: Armed Forces Commandant of Koblenz and, at the same time, Division Leader in the northern district of Wehrkreis XII. 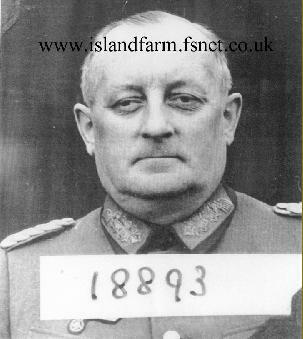 26 March 1945-15 May 1948: Prisoner of war. 14 April 1945 transferred to Trent Park Camp 11 sorting camp. 10 October 1947 to Hamburg onboard the ship "El Nil"